Well we've had quite an exciting weekend. 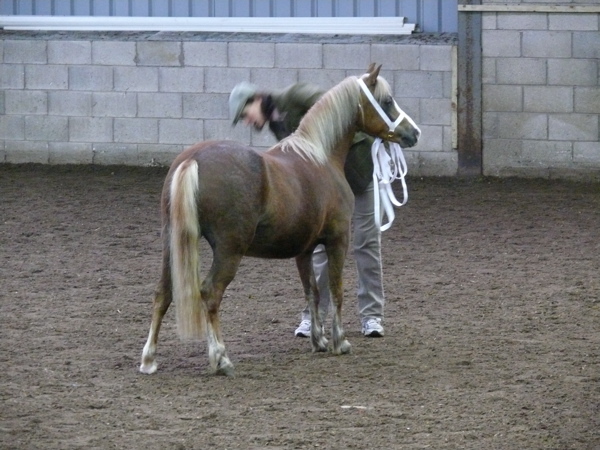 Firstly Runshaw Rhyfeddod left us to go under saddle for the Winter Novice shows. Can't wait to see him out and about and hope he does aswell as we hope he can do but he won't be rushed and time will tell how he takes to it all. 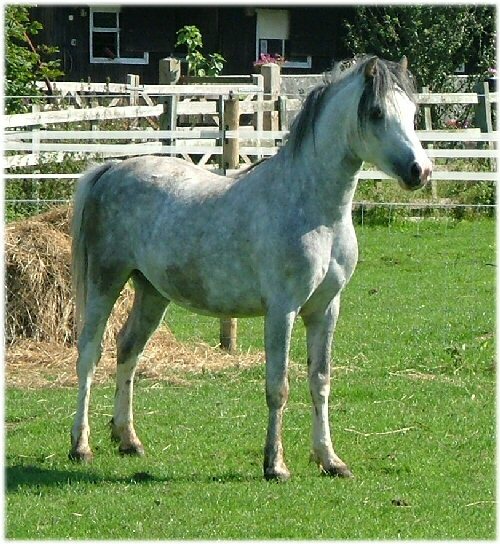 Secondly we have sold our beautiful stallion Runshaw Hafog. 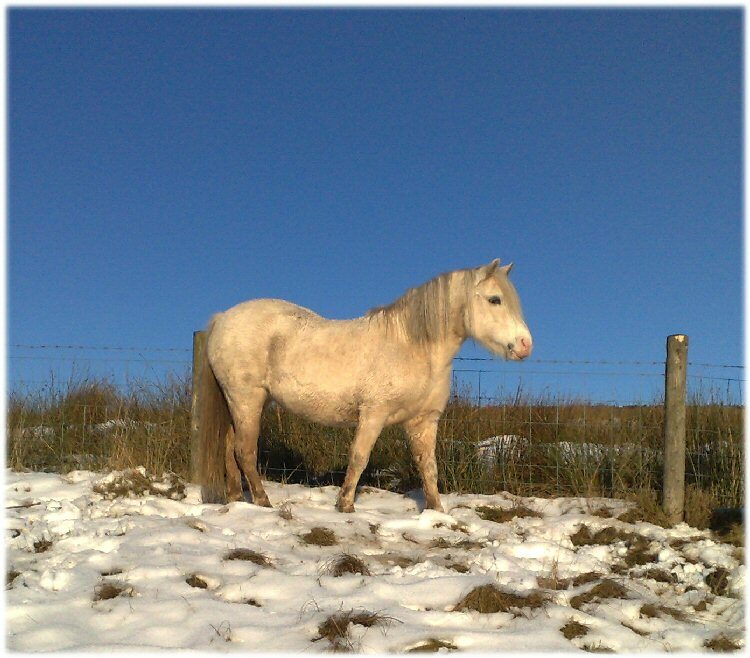 After much soul searching i felt he had far more to offer than i was ever going to give him the chance of due to other commitments and many other stallions so i thought i would advertise him and see if that perfect home came up and if not keep him at home for myself as always planned. With mixed emotions I am delighted to say the most perfect home and owner has come forward and i know he will be loved , cherished and shown to the best of his ability like he deserves but i am also somewhat gutted that my beautiful boy is leaving. I know i have made the right decision and more so when his new owner didn't stop smiling when they met and was still smiling when they left and Sox seems equally as smitten with his new owner. He leaves on Saturday the 13th for his new home and i wish them all the luck in the world for a fabulous future together but i can see it being a hard day seeing him leave. 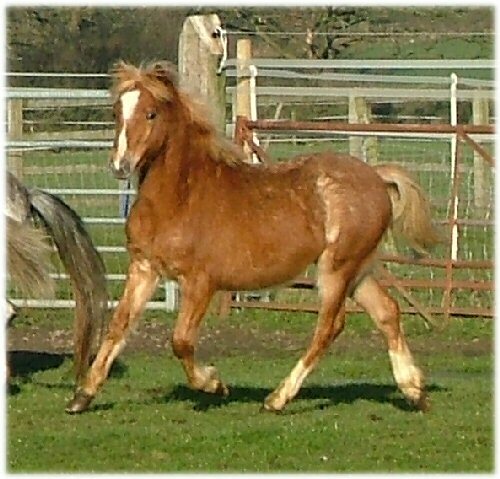 And finally we have actually weaned our 2 colt foals Runshaw Hyderus and Runshaw Brenin. Both foals have settled well and are happily eating me out of house and home and after an intial panic at losing her baby Standwell Black Fashion is settling down while Standwell Heidie never looked back! Runshaw Pendragon soaking in the Florida sunshine! Yesterday saw us live the day every owner knows has to be done but never comes easy. 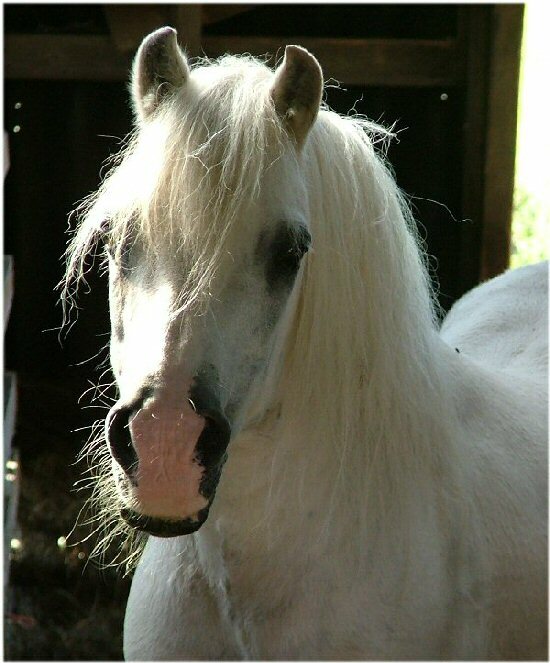 With many tears i said my last goodbye to my beloved stallion Coed Coch Barnwr at the age of 37. I always promised i would let him go with dignity and pride and yesterday morning he didn't want his breakfast and just looked tired and old. 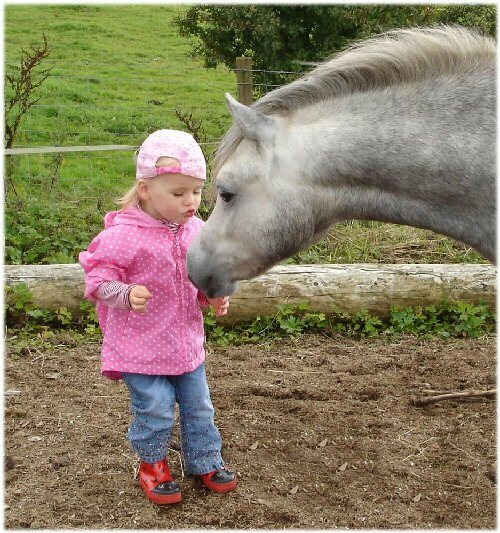 We both had a cuddle in the stable, without him attempting to bite which was unlike him, and i just knew he'd had enough so made the phone call we all dread. 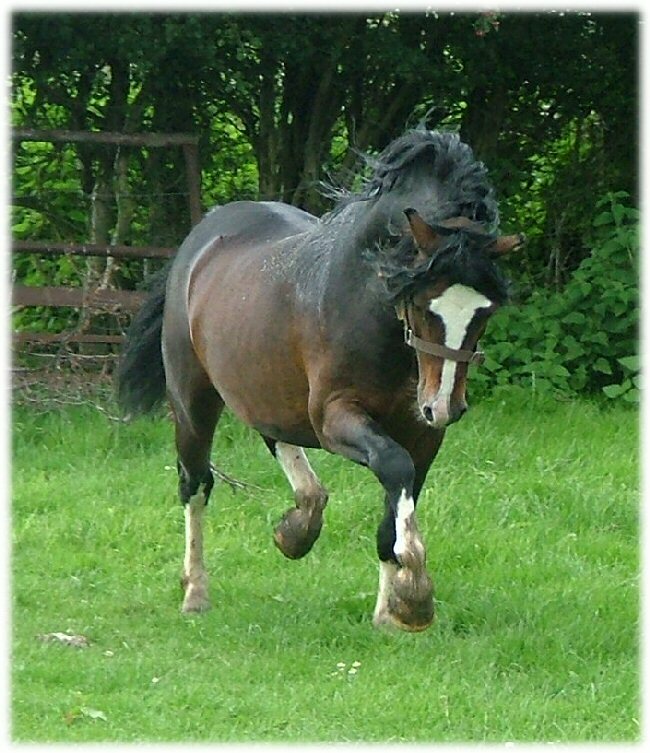 He was a wonderful part of our life for 10 years and taught us all so much in that time both as a stud and show stallion that we'll always be thankful he came into our lives. He owed us nothing yet we owed him everything and my final gift to him was to listen. We didn't take anything but went with an empty wagon and came back with and new addition. 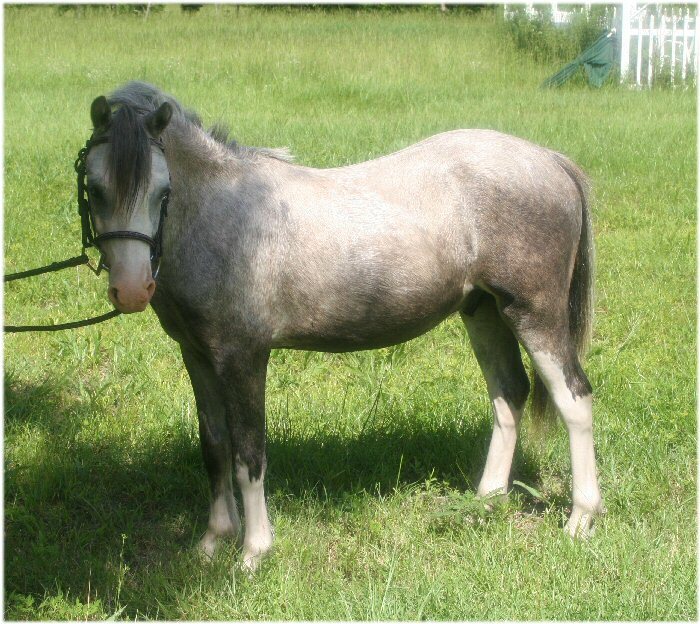 Please meet the beautiful yearling filly Delami Tia Dalma! 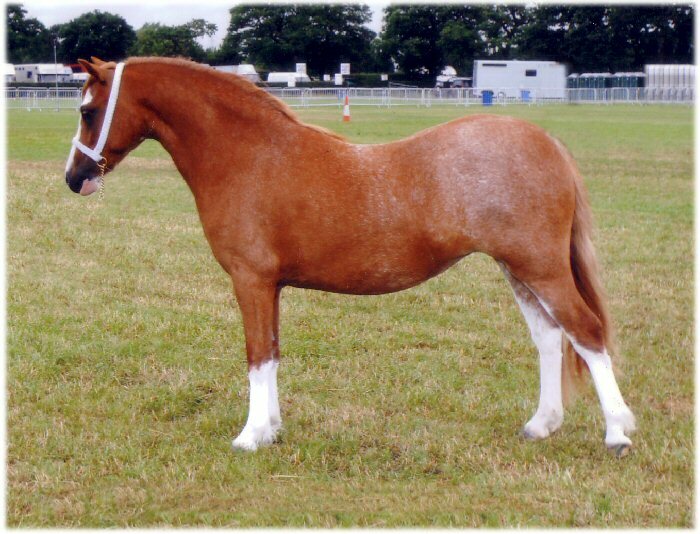 Thank you so much to all at the Delami Stud for allowing us to have this beautiful yearling filly and also for bringing her to the show for us to collect, much appreciated! 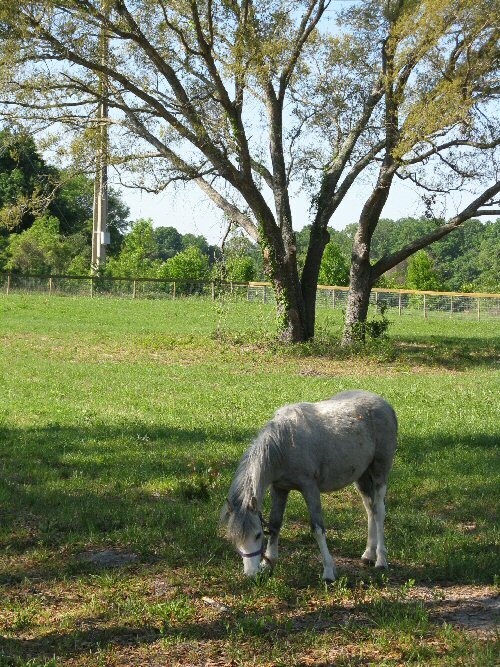 She is now happily grazing in the field. Silver Medal show on the beautiful Isle of Anglesey. 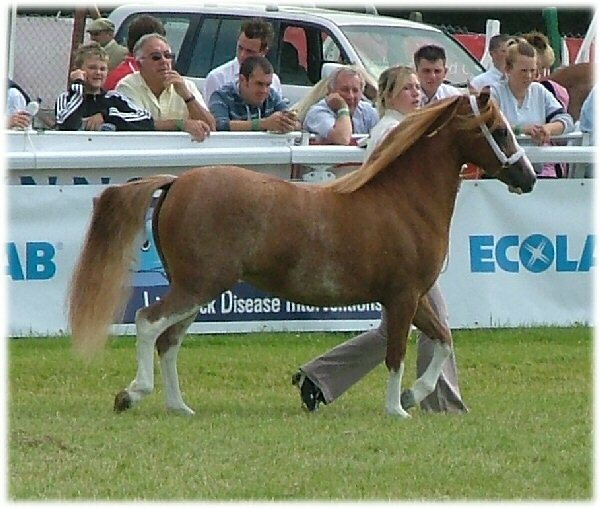 Meirion Davies from the Heniarth Stud judging the Welsh Mountain ponies. 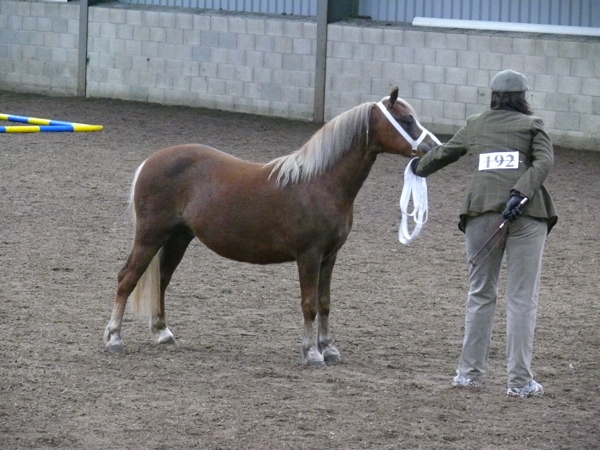 Our last show for Runshaw Heulwen this year and she stood a very creditable 3rd in a good 2 year old filly class. 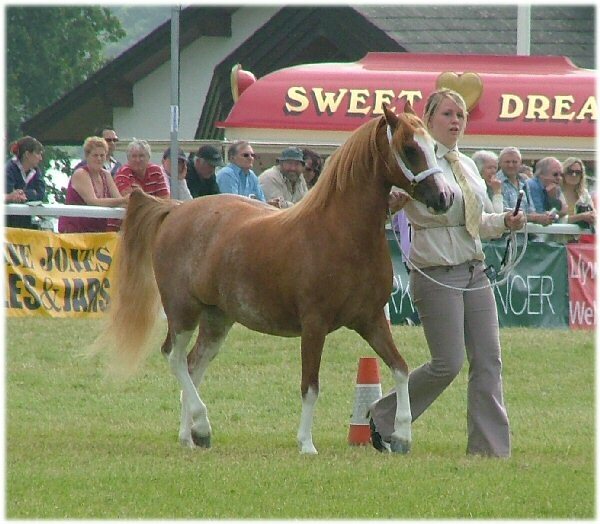 Officially now known as the largest Agricultural Show in Europe and THE show for the Welsh breeds! We were blessed with glorious weather and had a great break away. Tuesday saw Runshaw Superstar make his RWAS main ring debut and although wasn't placed thoroughly enjoyed himself and looked great! 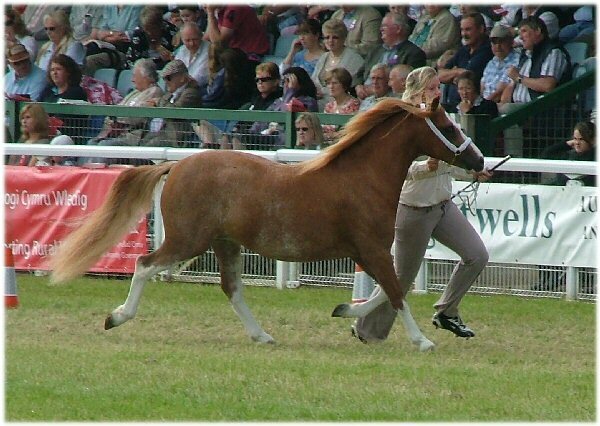 Wednesday saw Runshaw Heulwen make her RWAS debut too and we are thrilled to say was placed 6th out of 23 entries forward (initially pulled 3rd but dropped to 6th) The class was full of fabulous fillies from some great studs and to stand in the middle of them with my home bred girl is a fantastic feeling!!! Absolutely thrilled to bits with this result. Huge thanks must got to Nat Holland for showing them both so well in that scorching heat and enabling me to stand by the side of the ring and watch my babies run out along that fabulous grandstand in front of thousands of people from all over the world! Thank you! 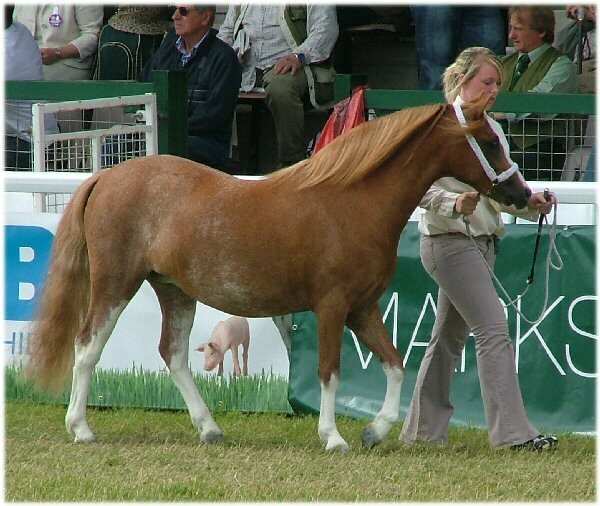 ThenThen it Runshaw Heulwens turn in the mixed 2 & � year old filly and gelding class, she was really on form today , really flying around the ring to stand 1st in a huge class! 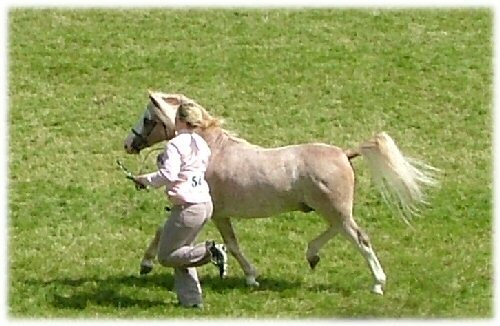 Then back in for the overall champion Welsh Mountain Pony and WPCS Bronze Medal where she flew again (she loved that show ground!) and after what seemed ages was pulled forward as Champion!! 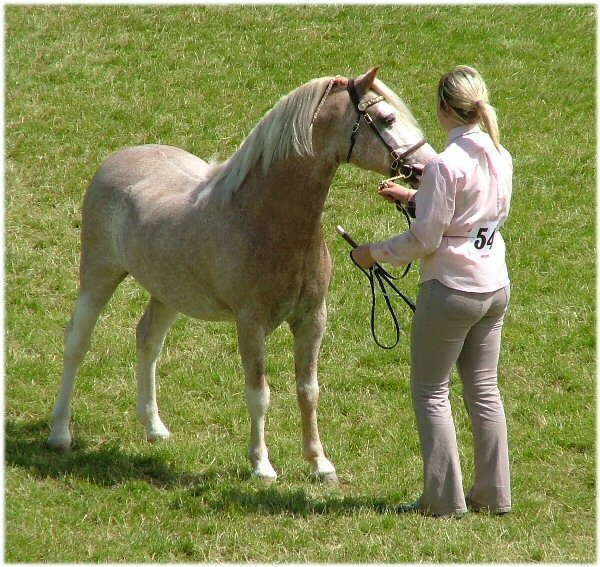 Judge was Mrs N.Clayton, Pinina Stud. 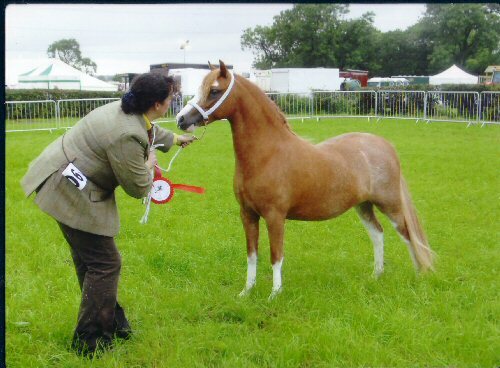 Thought by some to be the 2nd biggest show in the welsh breeds calendar we took Runshaw Heulwen today in the pouring rain and were thrilled to win a big 2 year old filly class and then stand Reserve Youngstock Champion! 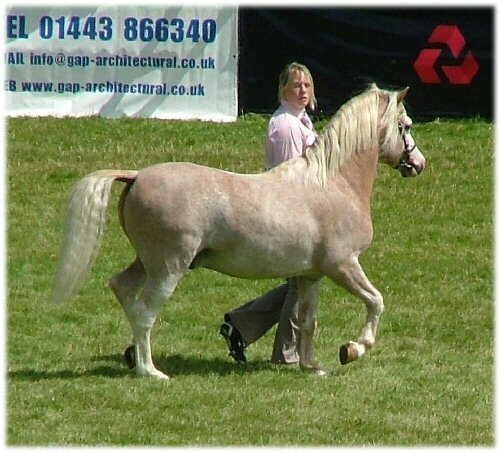 Judge was Mrs J Reed, Haverford Stud. 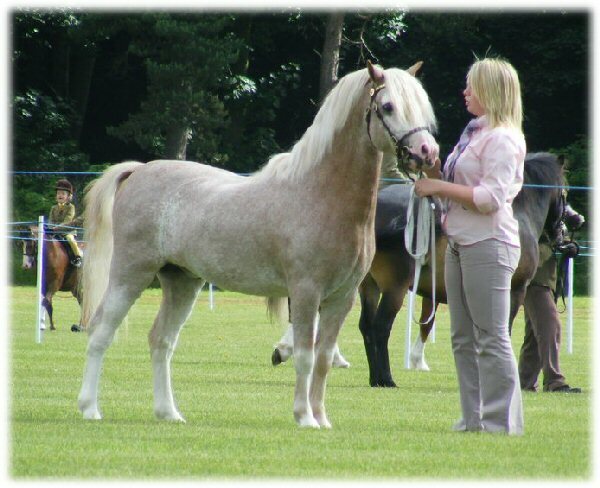 Runshaw Superstar had a day out today to East Midlands WPCS Show at Clumber Park, Notts. 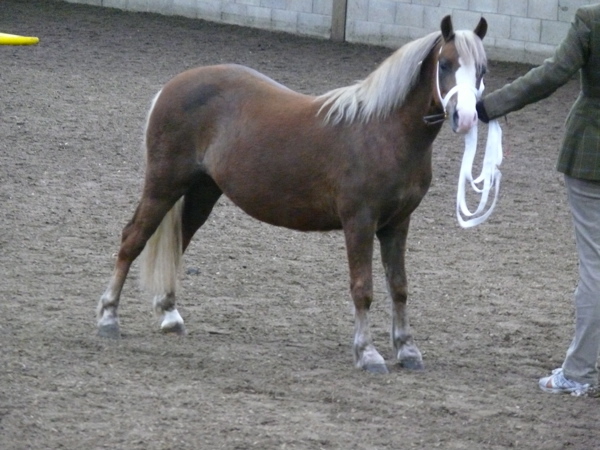 He was fabulously behaved , went really well and didn't disgrace himself until he left the ring and promptly decided he'd break his bridle and return to the ring with the Barren Mares! Many many thanks to all who helped catch him and yes, you'll not forget the pink pony now will you :-) Joking aside, nobody was hurt other than maybe some pride and all soon resolved and many many thanks again to Nat Holland for doing such a fabulous job with him! Runshaw Ladi Lilith has had her first foal over in her new home, the Marik Stud, Denmark and what a beautiful one he is too! 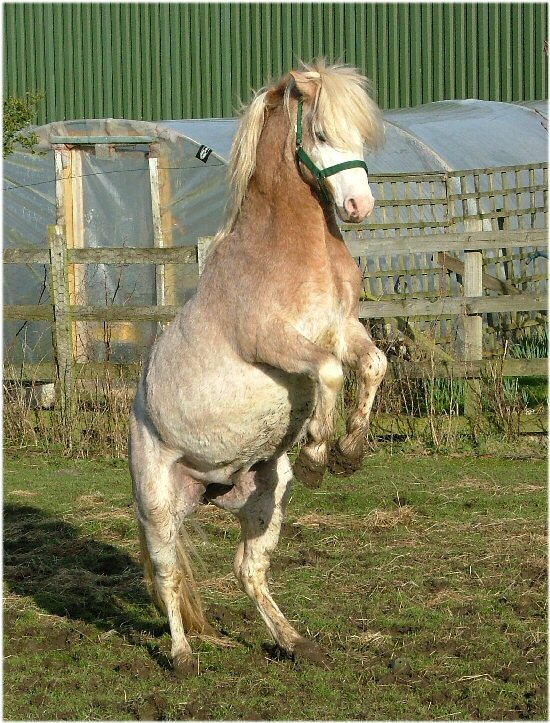 This lovely little lad is by our stallion Churtoncroft Aries and looks to be a good size for a first foal too! Sally (R.Ladi Lilith) has taken to her new role in life like a Professional and we look forward to updates of the fabulous little mans progress. Doesn't she know she's beautiful! 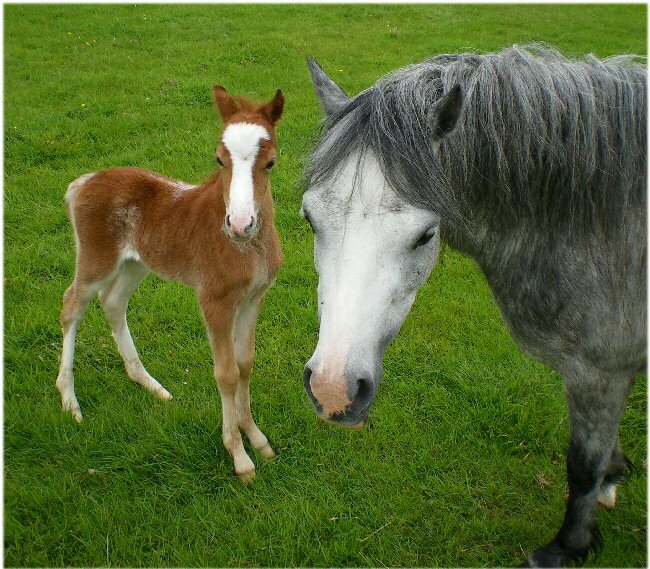 Many many congratulations Angela on such a lovely foal and well done Dream! 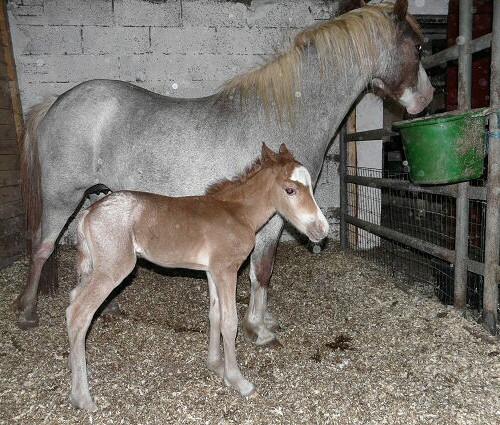 Runshaw Welsh Honey has now foaled and had a beautiful Dun filly. 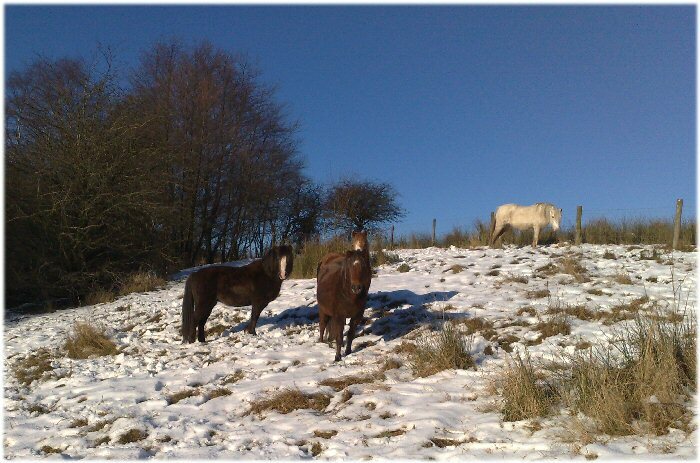 Details of Runshaw Welsh Doll and her 'brothers' are now on the foals 2008 page. 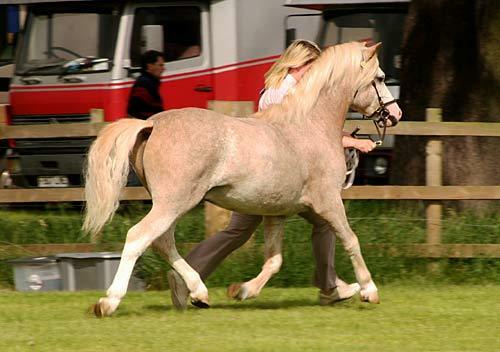 Northern Welsh and Native Breed Spring Show. 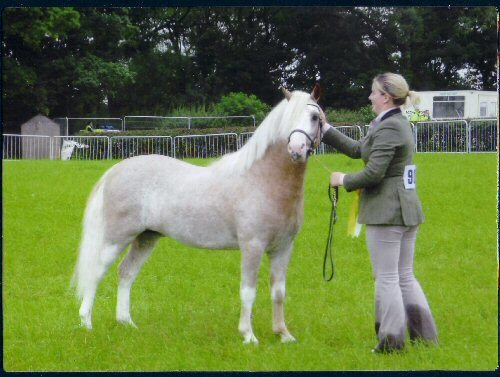 Runshaw Anwyled owned by the DragonParc Stud had a fabulous 2nd in the 2 year filly class. Sadly couldn't get there to watch but well done girls she looks fantastic! 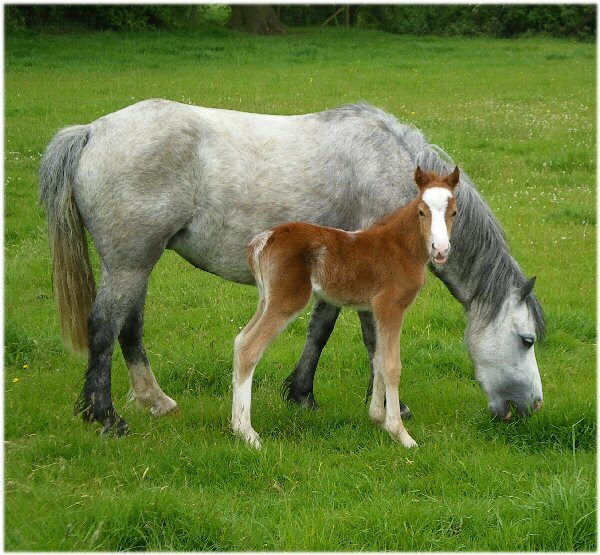 While we had a great day out at Lampeter Stallion show our beautiful mare Standwell Black fashion foaled in the early hours of the morning. 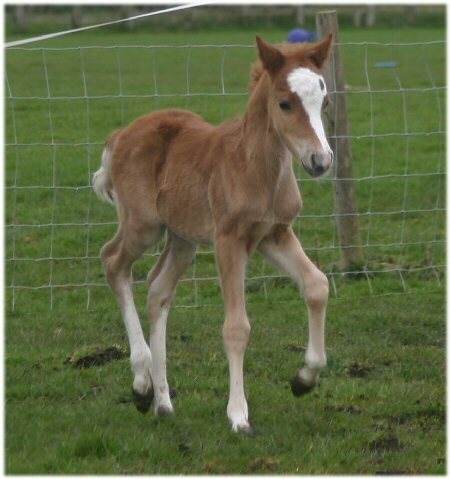 She's had a fabulous big string bay colt with a blaze and 4 white socks by Fosterhouses Supersam. 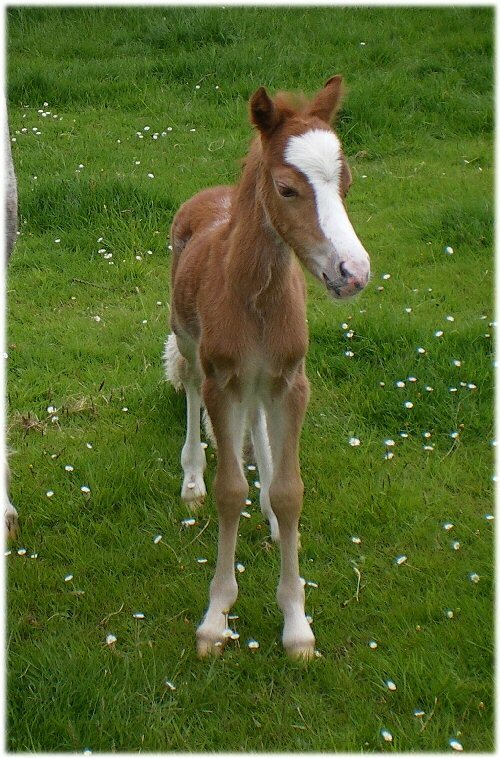 Picture now on the foal page and will be updated as he unfolds. Well after what seems an eternity i am sure for owners both old and new Runshaw Pendragon has finally arrived at his new home, Critchfield Farm, Florida, USA. 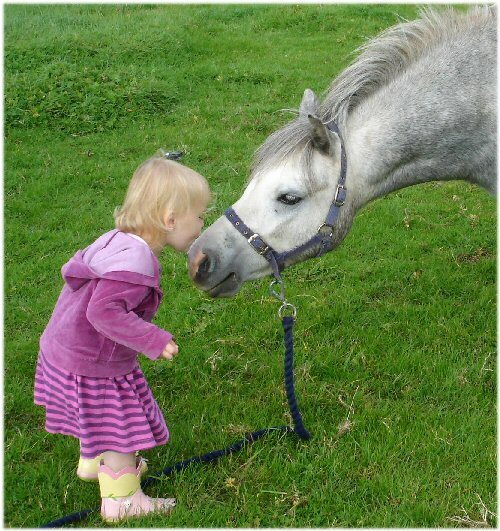 Many many thanks for everyone involved in looking after him so well, and Anja eeping em informed of his progress. He looks fabulous and none the worse for his adventure half way around the world and we wish him the very best for the future! The first foal of 2008 has arrived in the form of a rather nice chestnut colt by Churtoncroft Aries and out of Standwell Heidie 8 days over due but both fit and well. 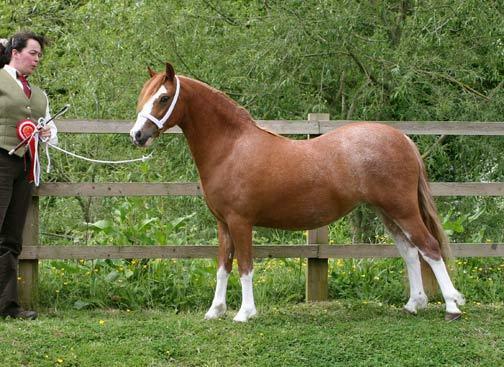 A beautiful big colt with a neat stripe and 4 white socks. 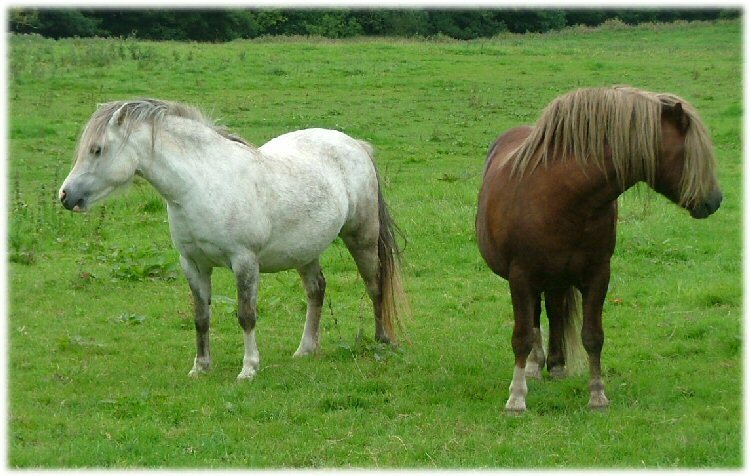 The end of march has brought to light the highs and lows of breeding ponies. 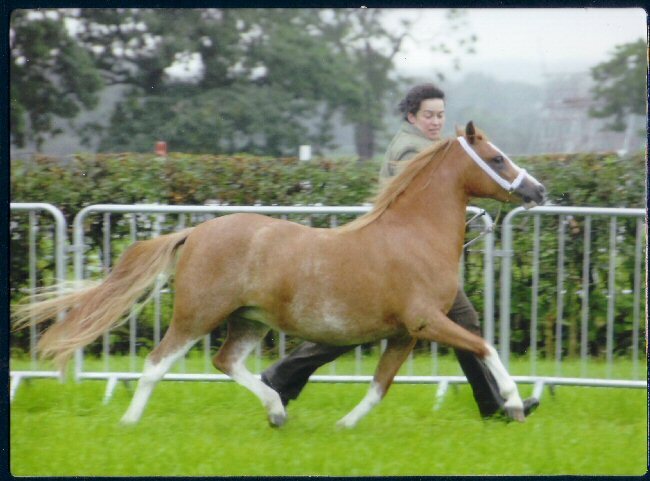 One of the highs are these gorgeous pictures emailed to me by the owners of Runshaw Romeo with his tiny owner in Scotland. 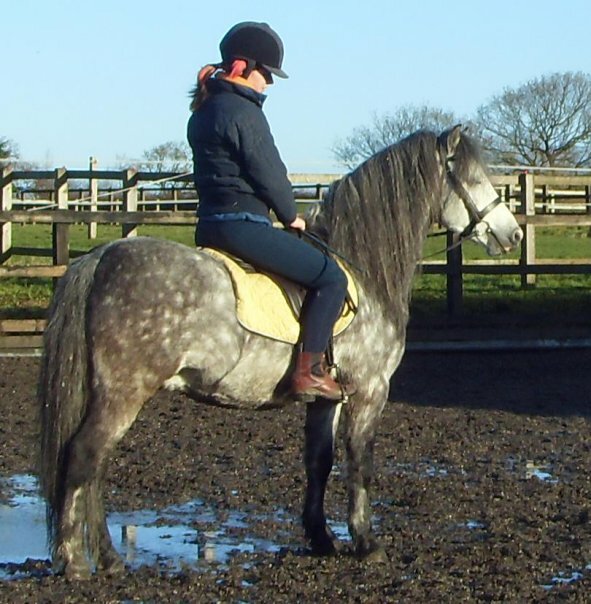 What a fabulous temperament he has and is currently being broken to ride for his 'little person' who he obviously adores. Lows have been the devastating news today that after being suspected of being hit by lightening in a freak storm the previous day the greatly loved and stunning rising 3 year old colt Runshaw Wynn Ap Aries lost his fight for life. 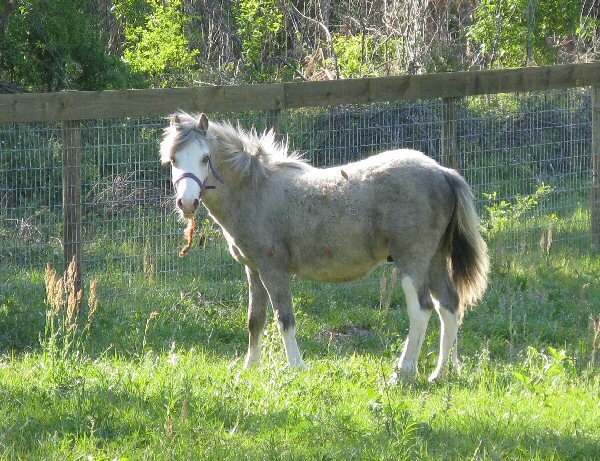 Words can't describe the character, temperament and sheer beauty this colt had and i , along with many others, were eagerly awaiting his maturity into the stunning pony he was developing into. 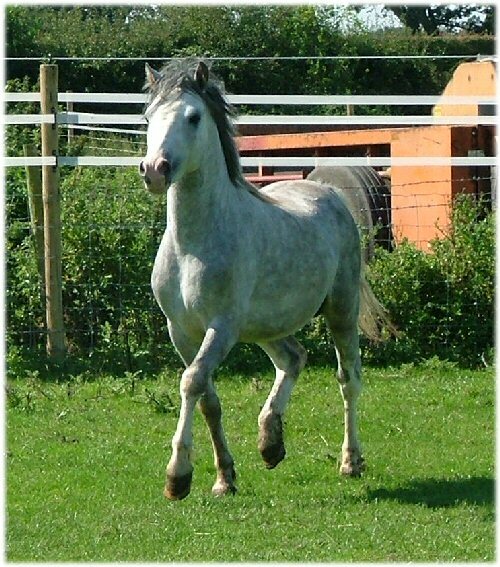 He had been retained by us until last year as a 2 year old as was felt to be that little bit special and until the perfect home came along he would be retained. That home came to light with Mandy , Ian and family on the Wirral last year and they fell head over heels in love with him and vice versa. 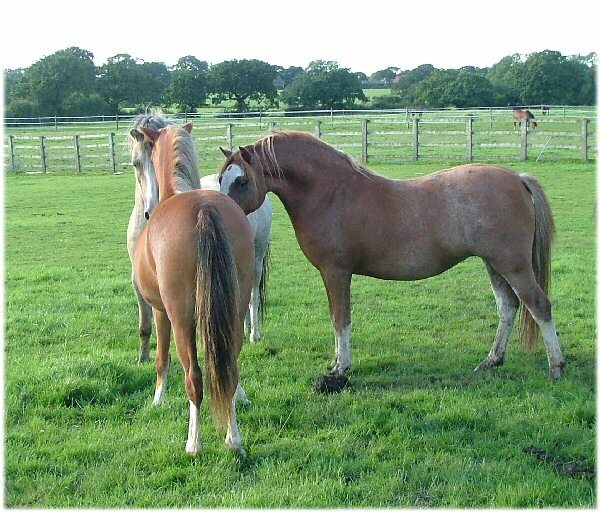 Due to less numbers than here 'Harley' would be ensured the individual attention he deserved and craved and to be loved and adored for the star he was which he got in bucketfuls in the short time he was with them. My heart felt sympathy goes to Mandy and family on such a tragic and sad loss. pictures below taken last August at 2 years old before he left. 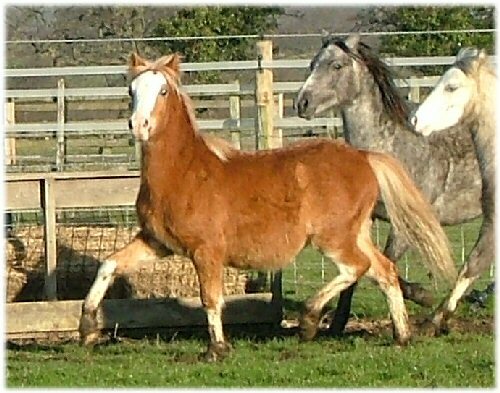 Just got the news that Runshaw Pendragon has arrived safe and well in Calgary on the next leg of his journey to his new home in Florida, USA. "They were the very first ponies ever to have been sent over unattended on the lower deck of a passenger plane, so a bit of history was made yesterday." Not sure i'd have been quite so brave but proud to be involved with a first and History making and Pendragon has arrived fit, well and passed all his tests so just goes to show i worry over too much. Many many thanks to P J Exports for looking after him so well! 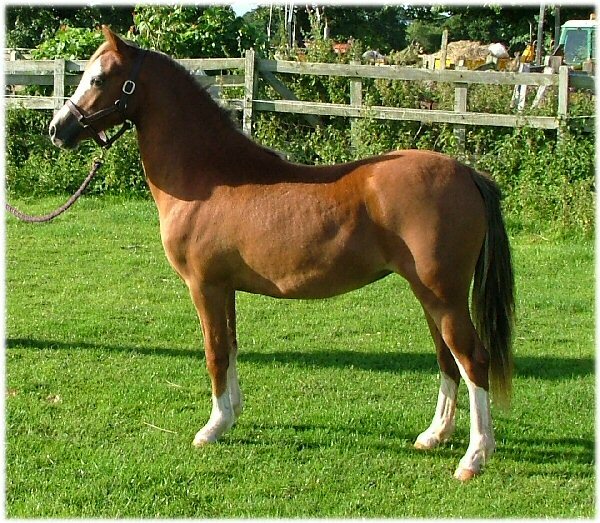 Today saw the collection of the lovely yearling colt Runshaw Pendragon by 'P.J.Exports' for his new owner in Florida, USA. We would like to wish his new owner Anja all the very best of luck with this lovely colt and look forward to his safe arrival in the 'Sunshine State' and his progress in his new home. Runshaw Superstar enjoying the sunshine! 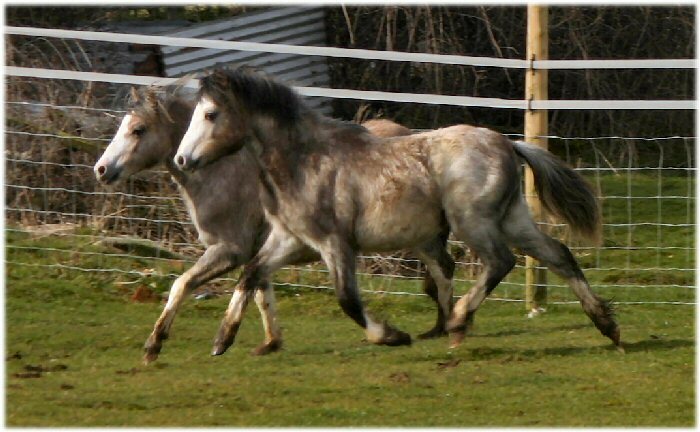 Well today saw Trevalyn Stud collecting their beautiful ponies to take home to their new farm in Wales. 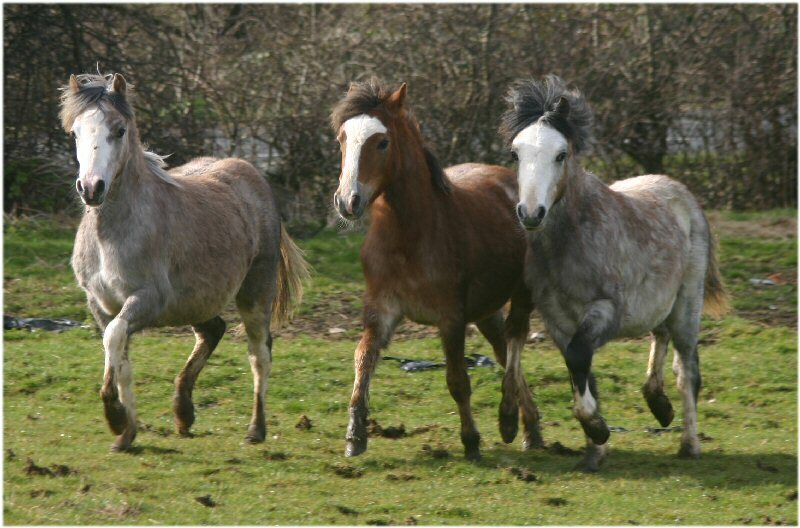 These include the yearling colts Runshaw Hynod and Runshaw Helfydd , and the beautiful young mare Runshaw Ladi Gwyneth. We wish Dawn and Sacha all the very best of luck with them and look forward to their progress. Somewhat belated but we received this picture just before Christmas of the yearling colt Runshaw Llewelyn (Churtoncroft Aries x Chetwynd Lily) down in South Wales at the Abertyleri Stud. He is maturing into a very beautiful colt as you can see above and we are looking forward to seeing him in the ring next year as a 3 year old and hopefully his first crop of foals too. 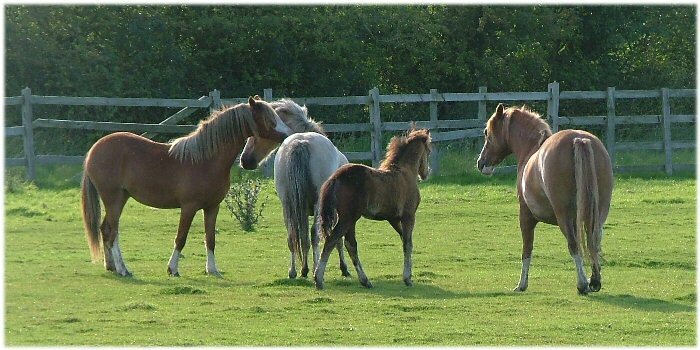 Wishing all our friends and visitors a fabulous 2008 with foals that you hope and wish for and much success both in and out of the show ring!